The Edwards house is 10,400 square feet including the garage. Since even a small two car garage is typically over 500 square feet (say, 22x24), that makes the main house itself less than 9,900 square feet. Seeing how just the main house at the Bush Family Compound at Crawford is 10,000 square feet without counting the garages I assume you'll complain equally about that, too. Right? Perhaps you'll still say that "building that kind of estate says something bad about a person" when it's a Bush? Perhaps you'll say that Bush's Pig Farm^H^H^H^H^H^H^H^H Ranch is "just wrong". What's with the insults? Your comments usually start with some kind of insult, either particular to me or in general to conservatives or Republicans. The insults do not strengthen your arguments. Quite the opposite. What's with the assumption of hypocrisy? Are you so Kos-ified that you assume that people like me are always bad, always dishonest, always stupid, etc? And can't you see things through any prism other than left/right politics? Ever? Go back to the article again, and you'll see that attached to the regular house is a gigantic building with all sorts of indoor exercise stuff plus "John's room." I submit that those square feet count toward the something-wrong-with-this quotient. But then, I'm just a stupid conservative hypocrite, so what do I know? 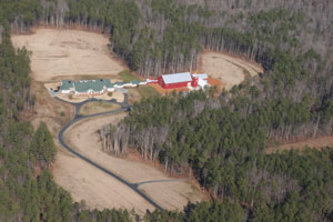 Bush's home and Edwards' home are the same size. Both were built that size when they were candidates for President. The one from the party you support drew no complaints. The one from the party you dislike drew multiple attacks from you disparaging the character of a candidate whose party you dislike. I asked for equal treatment. Either retract the attack on Edwards or equally attack Bush. That's trying to take away the political prism and treat both sides equally. Are you actually saying that it's unfair to hold Republicans to the same standards - that Republicans need some kind of Affirmative Action in ethics? As I said, criticize both or critcize neither. I'm fine either way. Just pick a set of rules and hold both sides to them equally. Actually, if I knew about both I would criticize both and for the same reasons. I'll take your word on the President's ranch, and I do think that big a house is very un-conservationist for anybody, egotistic, and tasteless. President Bush wasn't my man in the primaries, but he's my president now and I'm one who believes in showing at least as much respect for the office as one possibly can. Note that I always refer to Senator Kerry, President Clinton, etc. I think it's important. With former senator Edwards' estate, I must admit it stinks in my nostrils a little more. Why? Because it is Mr. Edwards who authored the "Two Americas" campaign theme. That's not hypocrisy on my part, but on his. Also, I have much less respect for medical malpractice lawyers than I do for oil producers and MLB owners. I think medical malpractice lawyers do harm to our society, whereas oil producers bring a vital commodity to market and baseball owners at least entertain and thus score a slight positive on my good-for-society scale. Please spare me the denigration of President Bush's pre-governor experience -- already got the T shirt. As for what's good for society, I think it's long past time we dropped cheap insults unworthy of our character. Such as this: "Let's actually read the article for a change..." , and this "Perhaps you'll say that Bush's Pig Farm^H^H^H^H^H^H^H^H Ranch is "just wrong", and this "Nah. Didn't think so." This one is actually kind of clever, so I don't mind it much: "... that Republicans need some kind of Affirmative Action in ethics?" Of course, I'm not saying that, I abhor affirmative action, and I seem to recall you got MAJORLY pissed when I put words in your mouth, but still, kinda witty in its own way. I really enjoy our conversation, and I appreciate your input. I have, as I hope you already know, a lot of respect for you. Regards. So the question is, on the Front Page, are you going to retract the comments on Senator Edwards or are you going to post equivalent comments condemning President Bush's character? (Oh, and it isn't appropriate to say that Bush was an oil producer in the pre-President days. He made the money to buy the pig farm (which it was before he remodeled the old buildings, built the new house and dug the famous lake) by selling the property associated with the baseball stadium - property siezed by government condemnation and effectively given to the stadium consortium owners. i honestly could not see anyone having a house that big unless it was more than them and their spouse living on it. maybe we should have a law that if you have land that big to live on you have to have some kind of garden/farm/ranch on it too to even out feng shu/karma. just my thought anyways. would you happen to know of any woodworking/carpentry courses in the miami,fl. area? i have not had luck in finding one.